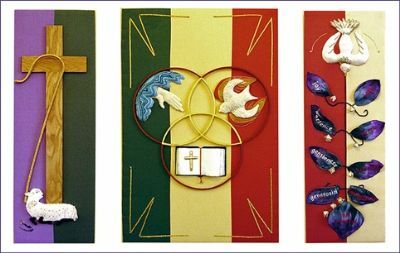 The Triptych was designed by Frances Hawken and was a church community project which involved several members of the congregation. 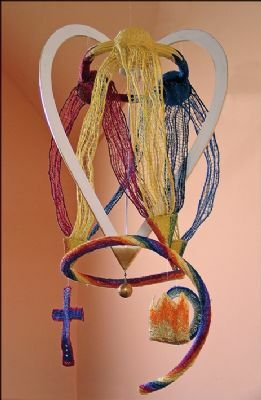 The Three Balls are all the same size and are connected equidistantly in a ring, showing a continuous relationship between the three persons of the Trinity. The Lace Strands from each ball indicate “the making space” and come together and blend into an upturned pyramidal shape. Each Pyramid has as its base an equilateral triangle so reflecting the equality of the three persons. The outside colour being different on each pyramid symbolizes the leading roll that each person makes in this “dance”. The points of the pyramids are joined to a Rainbow Spiral, so including all in this continuous “theatre” of Creation, Redemption and Consummation which is echoed by the Circle, the Cross and the Crown. The White Heart, edged with gold, has 3 equal sides and angles illustrating the perfection the holiness and the purity of God, who loves." "The meaning of perichoresis is often given as dancing (which is a nice picture of the dynamic interaction of the persons of the Trinity), but strictly the Greek word is not “xoreuw” – dance but “xwrew” – make room, give way. Each person of the Trinity creates space for the others: the Son is given the authority of the Father for his life and ministry, is empowered (anointed) by the Holy Spirit for it, and in turn points to the Father as the one who sent him and gives shape to the mission of the Holy Spirit, who comes in his name to the glory of the Father. It also involves the transfer of attributes which strictly belong to another person, for example, I would argue that we should read 1 Corinthians chapter 1 perichoretically, where we can describe Christ as the wisdom and power of God (which in Paul refers to the Father), by virtue of his anointing (i.e. as Messiah, the Christ, the anointed one) by the Holy Spirit, from whose operation all wisdom and power derive. This can also be worked out on the wider canvas of the whole history of creation where all three persons together, and yet each distinctly, the Father calling all things into being, the Son holding all things together (see Colossians 1 ) and the Spirit providing the dynamic for their development and perfection. But in this process, each is dependent on the other in creating the space for this to happen, not only between themselves, but in the theatre of the creation as a whole. It is also true as we look towards the future: the Holy Spirit opens up new possibilities in the name of Jesus, bringing all things more closely patterned on him, and in the authority of the Father, making us all more closely answerable to him."